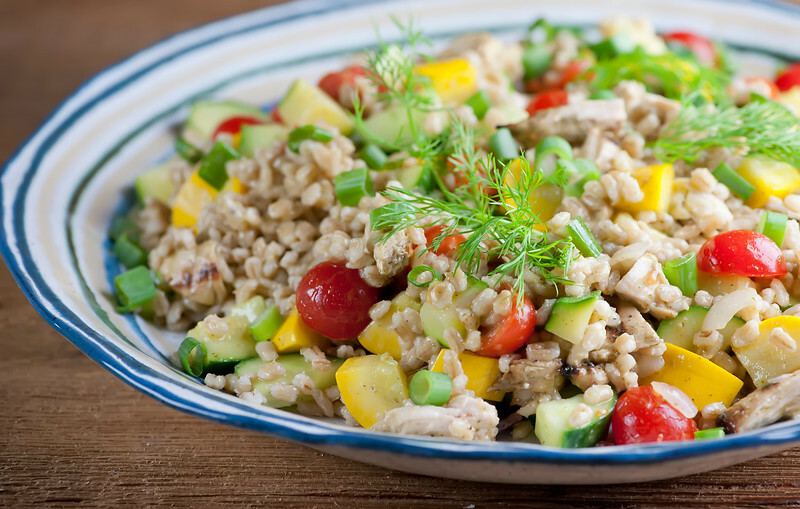 This easy recipe for chicken barley salad is full of healthy and delicious veggies and can be served warm or at room temperature. The perfect all season dish, and a great way to use up any leftover chicken you have hanging around! Say hello to one of my very favorite salads, for so many reasons. It’s full of cheery, colorful fresh veggies, it features nutty, chewy barley, and it’s got tender shredded chicken to give it some healthy protein. It’s tossed with a zingy lemon dill dressing. And you can have it warm or (if it is one billion degrees outside the way it is right this second as I am writing), it’s delectable at room temperature. Ready to fall in love with your new favorite chicken salad? Let’s make it! First, I need to send out some love to barley, one of my favorite favorite grains. (Sorry, rice.) 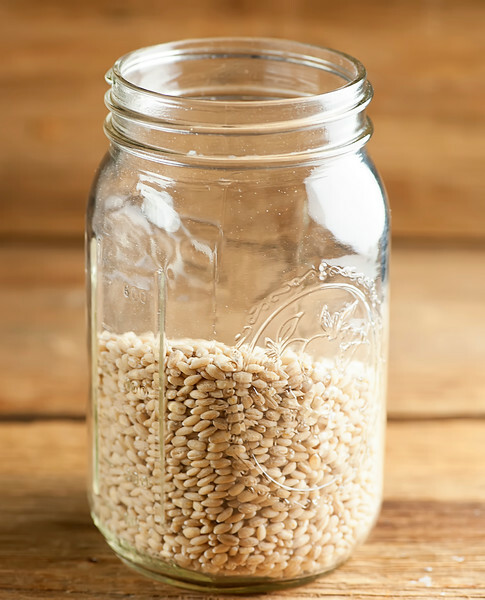 I always have it on hand in – what else – one of my mason jars. I have a mason jar obsession but that is a story for another day. I tend to cook with pearled barley because it cooks up faster, but you can use hulled barley as well, and here is a handy explanation of the difference between the two from the always helpful folks at The Kitchn. The other thing I need to tell you about are the red onions I used in this recipe. Usually I use half of a regular old red onion, but the last time I made this, my mama had just been to the wonderful farmer’s market in Paterson, New Jersey, and she picked me up a bunch of these at Ricky’s Produce stand. 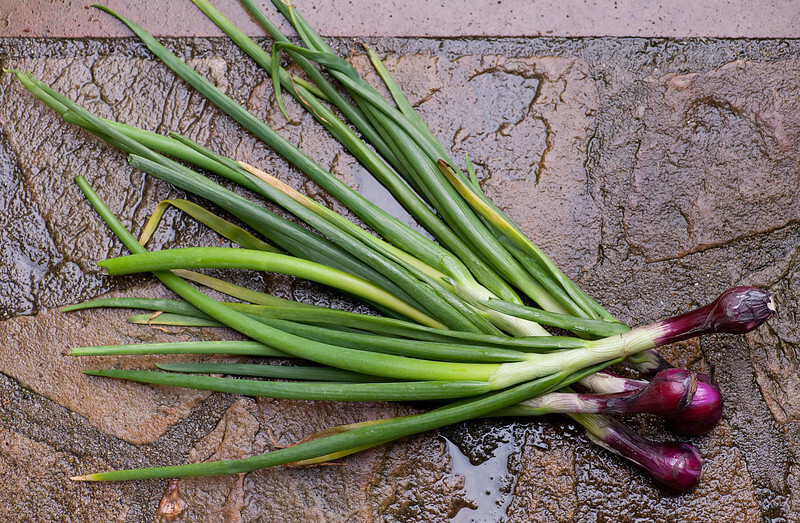 Red spring onions. They are smaller and sweeter than regular red onions, so if you ever run into them in your travels, make sure you grab a bunch. It was raining the day I got them, and for unknown reasons I was compelled to take their picture in the rain on my back steps. The Southern husband is just about used to this kind of behavior, but the dog was kind of confused. This easy recipe for chicken barley salad is full of healthy and delicious veggies and can be served warm or at room temperature. The perfect all season dish! #recipeClick to TweetAnyway, back at the salad…you are going to toss cooked barley with all kinds of summer veggies, a light lemon dill dressing that you shake up (in a mason jar, of course), and some cooked and shredded chicken. This is a great salad to use when you have leftover chicken, and I always make it a policy to have leftover chicken around. Here’s my all time favorite grilled chicken recipe, and I tend to double it just to make sure I have leftover chicken. And with that, I’ll leave you to try this chicken barley salad! What’s your favorite take on chicken salad? Tell me in the comments! Cook barley according to package directions, drain and set aside. Bring a medium pot of water to boil and simmer the squash until tender, about 3 minutes. Drain and set aside. Combine the olive oil, vinegar, lemon juice and half the dill in a jar, close tightly and shake shake shake until everything is well blended. Put the barley, squash, onion, cucumber, scallions, tomatoes and chicken in a large bowl and toss with tongs. Drizzle with the dill dressing and toss again. Season to taste with salt and pepper. Divide among plates and garnish with the remaining dill. This salad can be served when the barley and squash are still warm, or you can let everything come to room temperature and serve it that way. It’s also endlessly customizable – if you have other herbs or veggies that you like, substitute away! Well, I’m still taking my lunch to work, but it’s a MUCH shorter commute. :) :) Love the quinoa version, and we are definitely both charter members of the leftover chicken appreciation club! This looks very similar to my favorite dish from a local restaurant. I cannot wait to make this!